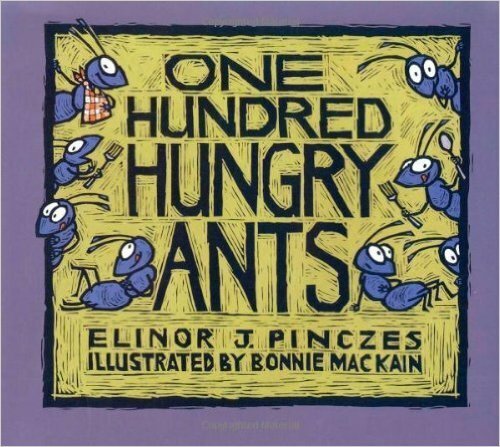 Elinor J. Pinczes's ‘One Hundred Hungry Ants’ (1993) follows the story of 100 hungry ants who are racing to a picnic far far away for some food. Initially, the ants are moving in a single file, then one of the ants suggests that they could get to the picnic quicker if they move in more than one lines. They first try moving in two lines of 50 ants, then four lines of 25, and so on. One of the great things about this story is that readers can clearly see how knowledge of division can help meaningfully solve a problem. The page illustrations of the ants moving in different numbers of lines also help young children see what division looks like visually. We can see this story being used by teachers and parents to provide a meaningful and fun context for children to learn about division using resources, such as blocks of Unifix cubes, to represent different total numbers of ants in each line. All in all, we highly recommend ‘One Hundred Hungry Ants’ to teachers and parents of children, aged 5+, and the story serves as a great foundation to another story by Elinor, ‘A Remainder of One’, which is also about division but with a remainder.